1.2 What side effects does cilantro have? 1.3 Can cilantro be taken during pregnancy and lactation? What side effects does cilantro have? 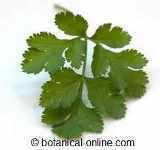 – No side effects have been reported by the intake of cilantro in the recommended doses. – In sensitive individuals, coriander can cause contact dermatitis. Can cilantro be taken during pregnancy and lactation? It is NOT convenient to use the essential oil of the plant through internal during pregnancy, lactation or in children younger than 6 years.